The Lytle Creek League of Conservators No Child Left Indoors volunteers are leading an almost-full-moon Owl Prowl on Saturday, January 7 at 6:30 p.m. We will meet in the Clinton Memorial Hospital parking lot in the area closest to the trail (lower area, south of the hospital). This hike will be on the Luther Warren Peace Path, which is accessible for all levels of hikers, including wheelchairs and strollers. Owls are establishing their territory and preparing to nest, which begins in the heart of winter. 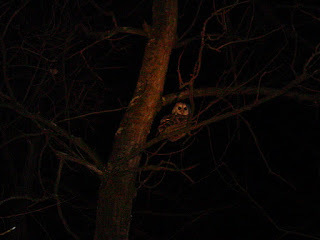 Now that the leaves have fallen it is a perfect time of year to spot owls and learn about their habitat and life cycle. This will be a fun experience for the whole family, led by local Ohio Certified Volunteer naturalists and interns. Dress for the weather, wear sturdy shoes and bring a flashlight and your sense of adventure. This program is free of charge and anyone interested in experiencing the natural world is welcomed. Please register HERE. For more information contact Lori Williams at 725-3811.